The first ever Intel chips with the Core i9 branding were released back in May with an 18-core beast. However, these powerful processors only supported desktops. Now, last year’s rumor has turned out to be true, and Intel has announced the 8th Gen Core i9 processors for laptops, along with Core i7, Core i5, and Core i3 chips. It’s the highest performance mobile processor they’ve ever launched, the company claims. Intel says that new chips are designed to improve both gaming and content creation experience for the users. The top-of-the-line Core i9-8950HK is a six-core CPU with 12 threads that can deliver a turbo boost clock of 4.8GHz (Base: 2.9GHz). Based on the 14nm++ Coffee Lake architecture, the new 8th generation chip can deliver up to 41% more FPS during gameplay, 4K video editing will happen 59% faster 4K video editing, and overall 29% performance improvement when compared to a 7th Intel Core i7. 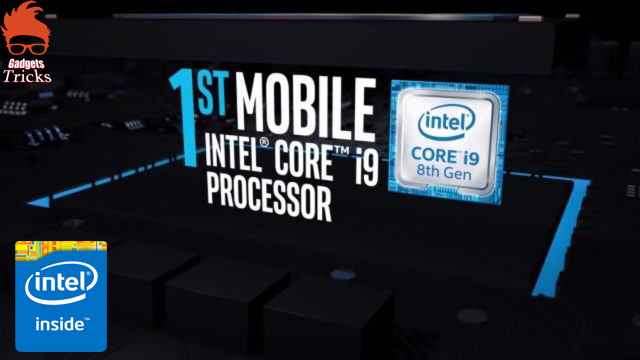 Alongside the various H-series and U-series mainstream mobile processors, Intel has also released new badges called Core i9+, Core i7+, and Core i5+ for laptops and desktops. These come with the Optane memory for improved performance and responsiveness. It can be used to accelerate frequently used applications, games, and files. the processor lineup comes with new Intel 300 Series chipset featuring the new WiFi -AC hardware that boosts speeds up to 1.7Gbps.